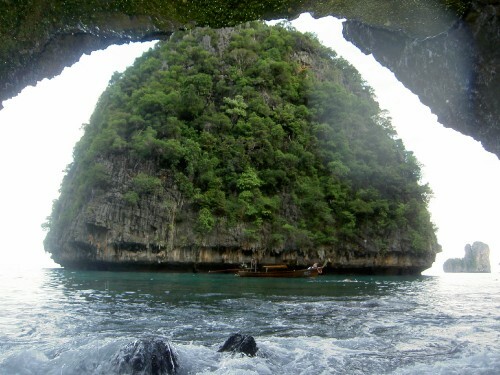 We left Phangan and had a bus and boat ride to get to a place called Krabi on the main land. We stayed here 2 nights before etting another boat to Phi Phi. There wasnt much going on realy so we watched some films and chilled out after a bit of a manic week with Kate's mates. Phi phi is another of those small islands off the mainland! It actually has npo roads on it but has numerous resorts, bars, restaurants and clubs on it! Plus a lovely beach. We met some girls going over on the boat and arranged to meet with them. I absolutly loved Phi Phi... the whole island is lovely and the surrounding are pretty impressive. We went out wiht hte girls one nite and i got chatting to some more people including some lads from near Chistlehurst and a group of 3 lads from Enfield! Me and Kate ended up spending around a week with them. We spent many a night watchin gthe thai boxing in one of the clubs and you can actually get up and fight yourself!! Dont worry i didnt cause i wouldve got beaten evben though im well ard!! But we did see these 2 huge girls get up and fight, it was hilarious and they were taking it so seriously!! Lots of Thai food was consumed..well not too much and lots of Chang beer too!! The weather was fantastic apart from one night where me and Kate got stranded in a restaurant as we saw rain like never before, it actually made a river and we saw a flip flop getting taken away! One of the days kate and i and the 3 lads we met, Adam, Rich and Keith decided to hire a long boat and go to the beach where the film "the Beach" was filmed! Even though it was rather touristy it was really beautiful and was just like from the film! As we got there we jumped off the boat a bit further out and for some reason decided to swim in... it wasnt funny! We thought we were gonna die it seemed to take for ever and we had a laugh trying to wave the thai man and the boat in!! Yet again very relaxed and chilled and good meeting and just chatting with more cool people. We were a little unfortunate on our last day on Phi Phi.. Kate fell really ill with a stomach bug but she soldiered on and we got off the island to Phuket with the boys. Then the next morning i was really ill and we actually missed our flight to Bangkok. No worries though we booked another one for the next day for the grand total of 30 quid each! We got to spend another day out with the boys and did some cheap shopping buying fake ralph lauren and Lacoste t shirts and also visiting Rich who was in hospital where he had been ill before and his antibiotics had racted badly!! This hospital was nicer than anyresort i had seen, he had his own room, wide screen tele and clean shower and hot water!! We wish we couldve stayed there! lol. He was out after one night luckly and was much better. We spent our last night with them in town and just went for something to eat. Kate and i then flew up to Bangkok for Kates last 3 days and what a weird 3 days they were! We hadnt realsied but we were right bang in the thai new year!! However the dont just celebrate with drinks one night like us... they go mental! It is so hard to explain but put it this way, they close off the main road and its surrounding in this case the Koh San Road and they just get as much water as possible and everyone soaks each other!! So there are thousands of peole with supersoakers getting each other wet. then the get this clay stuff and wipe and throw it over each other!?! Honestly its mental evryone is dancing on the street and you just get covered!! So we didnt really get to experience like we wanted too. We met up with 2 mates we met in NZ and also Kirsty and co came out aswell. We visited the grand palace which was pretty good even though we had to cover up so i had these ridiculous fisherman pants on and Kate had a long skirt and shirt on!! haha! Plus we were covered in clay and wet so looked pretty stupid! We got some more shopping in, well Kate did!! Then it was our last day before she wet home!! Was a rather strange and quiet day and not much was said. But i could tell she was excited and i hoped a little sad to be leaving. Nothing was said when the cab arrived she just gave me a hug and went!! I guess it is really strange now without here around seeing as though we spent more time together in the last 5 months than i have with anyone... ever!! But its what she wanted and im sure shes loving being home at this moment whilst im still living out of a backpack!! lol. But im gonna stick it out and try and enjoy my last 6 weeks. Got lots to do and will be travelling iwth Kirst and hopefully many more mates i make along the way. Cant believe i only have 6 weeks left though. Its gone so quick and ive even been in thailand for almost a month now. Im now back in Samui again and looking forward to the full moon party in 5 days... sounds like its going to be a big one with up to 10 thousand people!! you know how i like ot party! ive also gotta do my visa run tomo which is going to take me 16hrs, so not looking forward to that! But hey better than being put in prison!! Well im done so off to the beach to try and look more like a budda, without the belly! !